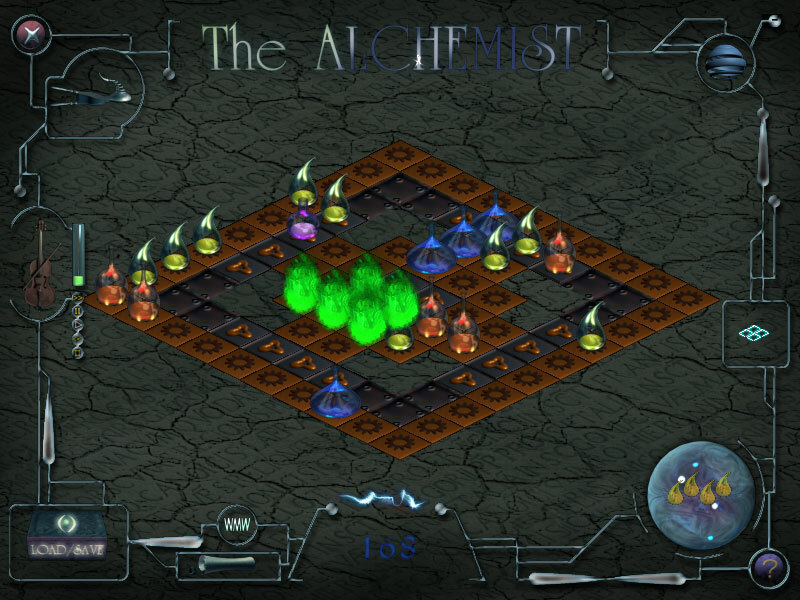 The Alchemist - logic puzzle game for mind and soul that's both challenging and fun! You're in a laboratory, with hundreds of test-tubes and retorts around you, trying to find the only combination that leads to success. Features 13 fantastic layouts, each with a different strategy, stunning graphic effects and online score list. Gothic music on the background, enigmatic sounds and thrilling medieval look and feel. The Alchemist was available as a giveaway on March 3, 2007! Fully customizable: change board size and shape, number of game pieces, etc. To find out what are the game rules, please start the game and press F1 key or help button in the lower right corner of the game field. ConceptDraw VI is designed for professional flowcharting, diagramming and illustrating. Its flexible, handy tools help business and technical users quickly document complex structures, systems and processes. ConceptDraw charts can be shared as a variety of graphics files and CAD documents, printed pages, presentations and web pages. Owing to the advanced libraries of pre-drawn shapes, ConceptDraw is perfect for most of the charting tasks. Game Seeker (#56) - That's because they use UnInstallShield in Common Files mode... irregular, but nothing suspicious. As for it "starting" in %windir%, that doesn't mean anything. The technical detail here is that the "start directory" only affects relative paths (and external commands) used by the program; Since UnInstallShield would use absolute paths anyway, it doesn't matter where it starts. game needed to be activated before the Giveaway offer for the game is over, next time, please, сarefully read the instructions which you can find in readme.txt file. This readme.txt file is enclosed with all our downloads. GroverDude, game needed to be activated before the Giveaway offer for the game is over, next time, please, сarefully read the instructions which you can find in readme.txt file. This readme.txt file is enclosed with all our downloads. If there was a "full" version here, like promised, this would be a rippin' game. But since it stops after only 30 moves, it sux. I could not get the game to work. The 1st screen froze and kept loading and loading and I had to shutdown to stop it. Do you only get 1 day to play this game? I could not get the game to work. The 1st screen froze and kept loading and loading and I had to shutdown to stop it. Do you only get 1 day to play this game? Re:#69 Ultra_Sunshine: You still heard music after uninstalling the game because the game was not closed, it was only minimized. There is an unfortunate bug in this game that makes it disappear from Windows task bar on minimizing. Also, the "X" control to close it completely is on the left side of the screen instead of to the right of the "-" to minimize. The fact that it was still on your running processes list means it did not uninstall, which it would not as it was still running at the time of uninstall attempt. See if it still shows up in Add/Remove programs in Control Panel. If not check your hard drive and registry to remove whatever may be left. If you're not absolutely sure how to edit your registry please get someone offline to help you. Re:#69 Ultra_Sunshine: You still heard music after uninstalling the game because the game was not closed, it was only minimized. There is an unfortunate bug in this game that makes it disappear from Windows task bar on minimizing. Also, the "X" control to close it completely is on the left side of the screen instead of to the right of the "-" to minimize. The fact that it was still on your running processes list means it did not uninstall, which it would not as it was still running at the time of uninstall attempt. See if it still shows up in Add/Remove programs in Control Panel. If not check your hard drive and registry to remove whatever may be left. If you're not absolutely sure how to edit your registry please get someone offline to help you. Slava's instructions helped get this game installed; thank you, Slava! The game has the potential to be absorbing; two flaws: the calliope-type music (what were you thinking, Odessa?!) and the small, difficult-to-see screen. I will try some of the suggestions on replacing the music (great idea, that) but the small viewing area makes this otherwise-interesting game an exercise in frustration. A thumb-up. Slava's instructions helped get this game installed; thank you, Slava! The game has the potential to be absorbing; two flaws: the calliope-type music (what were you thinking, Odessa?!) and the small, difficult-to-see screen. I will try some of the suggestions on replacing the music (great idea, that) but the small viewing area makes this otherwise-interesting game an exercise in frustration. A thumb-up. for me the "-" button minimizes to nothing. After i press it, the game is nowhere to be found ( task bar, tray bar or otherwise ) but in the "running processes" list. And i am running the default winxp desktop, not the one that was posted couple days ago. This is worse than Beta. The activation instructions state to use the activation first then install the game. It would not activate and only allowed the game to be played to a certain level (Like anyone would want to pirate this piece of trash). To make matters worse, that annoying music would not stop playing even after the program closed. Even after the program was uninstalled the tra la la continued!!! Finally, got the bloody noise to stop by stopping the process Alchemist in the Task Manager, which incidentally was a CPU HOG. Something is very wrong with this program on many levels. The company is only giving away a handful of this program and the PR associated with the sour taste of this experience was worth a functioning version (OLD OR NOT but at the very least functioning version). Updates to increase options may have been sold in this manner. Shame on the company for sending this as their calling card. This is worse than Beta. The activation instructions state to use the activation first then install the game. It would not activate and only allowed the game to be played to a certain level (Like anyone would want to pirate this piece of trash). To make matters worse, that annoying music would not stop playing even after the program closed. Even after the program was uninstalled the tra la la continued!!! Finally, got the bloody noise to stop by stopping the process Alchemist in the Task Manager, which incidentally was a CPU HOG. Something is very wrong with this program on many levels. The company is only giving away a handful of this program and the PR associated with the sour taste of this experience was worth a functioning version (OLD OR NOT but at the very least functioning version). Updates to increase options may have been sold in this manner. Shame on the company for sending this as their calling card. I appologize, but I don't think I'm the only one still not set. If there is a code number, would someone please write it down for us. If not, how do you register? I have done everything suggested and I don't think I am, because there is no icon and it still has a registration option. Any help would be appreciated by us all. Last one, I promise: Is there an icon for this game? Oh, I forgot - my question: Once the game is properly activated and registered, does the "registration" notation on the face of the gameboard (low, center, on the left) disappear? If not, how do you know? #45 (and others)I don't understand what makes you think comments are deleted. If it is the discrepency between the "thumbs" and the numbered comments in both number and impression of the game, there is a misunderstanding of how the "thumb" value is generated. Try moving your cursor over a thumb and see what happens... If it is by the numbering system, all my numbers are consecutive, aren't yours? If it is by illogical flow of the thread, have you taken into consideration the sometimes long delay needed to "moderate" our offerings - leading to answers appearing and questions not reflecting so? or what?? Could you be more specific, because I don't see it. Perhaps the moderators could print a few deleted comments using "x-outs" of expletives or objectionable material, so we can see what is inappropriate or indicate #2 (or whatever) deleted as others have requested. Finally, perhaps late in the day (just before next day turnover) they could write: No (or 1 or 2) comments were deleted today (with or without explanation), for a couple of days to reassure people. #35 The "retards'" as you incorrectly label them, would be the ones who write "try and look" when they mean "try to look." What kind of person needs to insult and abuse a stranger who may be new to computers and/or the site, is possibly using a totally different system and is running into a problem. Have you neither compassion nor manners? 3. how to indicate thumbs-up or thumbs-down, after trying the game! It would simplify everyone's download experience; it would prevent a lot of frustration and subsequent postings and it would eliminate so many meaningless and redundent comments. Found the answer to my question in the forums. Window's Explorer must not be in "Work Offline" to activate properly. If you're like me and use Firefox or another program most of the time, make sure that the last time you used Internet Explorer that you didn't leave it in Offline mode or you won't be able to connect to Giveaway of the Day and activate. I turned off my firewall and my antivirus program and still can't get through to activate online. Any ideas? I've downloaded and activated a bunch of games here in the past. The only thing I've changed to my system lately is the Giveaway of the Day windows shell Aston. I can't find how that would affect this though. Help! I can't get past "activate" because I keep getting a message that “Activation module failed to connect to giveawayoftheday.com Software activation is not possible at the moment. Please try again later or check your firewall settings.” I turned off my firewall and my antivirus program and still can't get through to activate online. Any ideas? I've downloaded and activated a bunch of games here in the past. The only thing I've changed to my system lately is the Giveaway of the Day windows shell Aston. I can't find how that would affect this though. Help! When you uncompress the files you will have another setup file in that folder along with the activation key. run that setup also then use the activation key to activate the game. works fine for me.. I spent ages trying to find the editor that is mentioned, but no luck. I've contacted the tech department to ask about it, so if I receive anything positive i'll post it over in the forums, as well as mention it on the day. After install I play and after 30 moves it says I have to buy or not play anymore. I restarted my computer and redid the setup and so forth but still the same thing. HELP PLEASE. Re:#47 Keilaron: Found the same on minimizing, gone from system tray. Also didn't show on task list under applications after minimizing, only on processes tab. In Start menu, have a look at that string for "Remove Alchemist" in properties. Never saw one like it, quite long and starts in C:/Windows even if you installed the game to a different drive. well i think this is just a stupid it doesn't even tell you how to play it. it isn't even fun! who thought of it! this game is so boring. it has no instructions and it is not fun. i did no like this game. Just wanted to note for those having Registration problems. Install Program first, and then run the Activate program before starting Game. Otherwise, game install will overwrite the Activation Registration Key with Demo. Ran Activate...then setup with Giveawayoftheday in name and company, left demo as default, closed game and ran activate again. It registered it just fine....Instructions to play game lower right corner, click the ? It's not necessary to place the "Activate.exe" in the same folder as the game. The file just connects to the Internet and adds an unlock code to the registry. It's not necessary to place the "Activate.exe" in the same folder as the game. The file just connects to the Internet and adds an unlock code to the registry. This game is different, I like it. After reading how to play at the developer's site it can get quite absorbing, no timer limits on solving is nice too. The graphics look good, perfect for the subject of the game. Registration works fine as per instructions in post #20 by Slava. If you activated first as per readme.txt, no problem! Just close the game and run activate.exe a second time, as detailed in post #23 by Lynn. To close the game (so you can run activate.exe again) look for the "X" to close it on the LEFT side of the game board, it's a red ball with a silver "X". Click that, game will ask if you want to exit, click "yes" to close. Then run activate.exe a second time and game will be registered. You will know it's registered when the game is opened again and the "Registration" button on the bottom right is gone. Finding game options isn't hard either, hold mouse cursor over different parts of the game board and look in the small message box at the bottom. How to play is completely detailed at the developer's web site, that page can be saved for offline access if preferred. You can change the default board configuration in options, keeps things interesting. As others mentioned, if preferred music can be easily changed to your own favorite midi files. A step-by-step of exactly HOW to change the default music files is beyond scope of a comment section, so anyone who can't figure it out themselves ...oh well. But don't worry, there's also a control within the game to shut off the default music. This game is different, I like it. After reading how to play at the developer's site it can get quite absorbing, no timer limits on solving is nice too. The graphics look good, perfect for the subject of the game. Registration works fine as per instructions in post #20 by Slava. If you activated first as per readme.txt, no problem! Just close the game and run activate.exe a second time, as detailed in post #23 by Lynn. To close the game (so you can run activate.exe again) look for the "X" to close it on the LEFT side of the game board, it's a red ball with a silver "X". Click that, game will ask if you want to exit, click "yes" to close. Then run activate.exe a second time and game will be registered. You will know it's registered when the game is opened again and the "Registration" button on the bottom right is gone. Finding game options isn't hard either, hold mouse cursor over different parts of the game board and look in the small message box at the bottom. How to play is completely detailed at the developer's web site, that page can be saved for offline access if preferred. You can change the default board configuration in options, keeps things interesting. As others mentioned, if preferred music can be easily changed to your own favorite midi files. A step-by-step of exactly HOW to change the default music files is beyond scope of a comment section, so anyone who can't figure it out themselves ...oh well. But don't worry, there's also a control within the game to shut off the default music. A correction on what I've previously said: If you place the MIDIs in the directory while the game isn't running, it'll play all the MIDIs the next time it runs. If you do it while it's running, it'll only play the MIDIs it saw when it originally started. Bizarre bug: Minimizing the game causes it to vanish from the taskbar. #36, is it true there is no full screen mode? I was looking in the options and I can't find it. If that's true, then who would pay 20 dollars for a game like this that's the same size as an online game? I can barely see where to place the vials, Full Screen mode is an absolute must for a game! This is my first negative comment ever, but I am quite disappointed in this game. Isn't it about time for another Arkanoid clone???? It looks like I'm comment 40. How can there be so many more listed (11 I think) than there really are? Do you delete that many? Can't you just delete the nasty words? Also, most of the comments aren't good while the "thumbs" up is 78% which is way off the real count. I read these comments and look at how many are thumbs up and thumbs down to see if I should download because I don't want to have to go through what happened a few days ago (which, by the way, I lost several hours of) when I foolishly downloaded the Aston program. Can't I trust this either? I would get rid of the "1st to comment" comments as they're useless before I would can a comment because of the explatives. At this point I don't know if I even want to take the chance on this program. I'll check back later. It looks like I'm comment 40. How can there be so many more listed (11 I think) than there really are? Do you delete that many? Can't you just delete the nasty words? Also, most of the comments aren't good while the "thumbs" up is 78% which is way off the real count. I read these comments and look at how many are thumbs up and thumbs down to see if I should download because I don't want to have to go through what happened a few days ago (which, by the way, I lost several hours of) when I foolishly downloaded the Aston program. Can't I trust this either? I would get rid of the "1st to comment" comments as they're useless before I would can a comment because of the explatives. At this point I don't know if I even want to take the chance on this program. I'll check back later. On the website on page http://www.alchemist-game.com/InfoRoom/inforoom.html it states there is a "· FREE editor for creating new levels" Cant find it in the instalation provided both here and when downloaded from their own site. Anyone got a clue to where it is hiding? Couldn't see such an editor in the GGAOTD distribution or in the distribution downloadable from the games website. Any idea where it's hiding? GuestBook page is kinda redundant as it's setup as a feedback page and there is already one of those. Top Lists page just doesn't work even if you send in your scores. Been playing, and still like the gameplay... Had a little explore of games website and noticed it says there should be a "FREE editor for creating new levels" on page http://www.alchemist-game.com/InfoRoom/inforoom.html Couldn't see such an editor in the GGAOTD distribution or in the distribution downloadable from the games website. Any idea where it's hiding? GuestBook page is kinda redundant as it's setup as a feedback page and there is already one of those. Top Lists page just doesn't work even if you send in your scores. Took me a fair while to notice where the music controls were, for some reason. The amount of tracks is hardcoded, but you can replace the MIDIs with your own by going into the appropriate directory (There's something amusing about listening to the DOOM theme while playing this game.). In plain sight within the game's directory. Activation went a little bizarre, but it worked when I followed Slava (#20)'s instructions. Changing settings in the options screen causes the game to end, regardless of what you change - beware. Other than that, though, 'tis a nice game. Perhaps 10$ value. Unlike Paco (#16), I didn't need to reboot. Took me a fair while to notice where the music controls were, for some reason. The amount of tracks is hardcoded, but you can replace the MIDIs with your own by going into the appropriate directory (There's something amusing about listening to the DOOM theme while playing this game.). In plain sight within the game's directory. Activation went a little bizarre, but <strong>it worked when I followed Slava (#20)'s instructions</strong>. Changing settings in the options screen causes the game to end, regardless of what you change - beware. Other than that, though, 'tis a nice game. Perhaps 10$ value. Unlike Paco (#16), I didn't need to reboot. I love this game. Thanks. thanks to the peepes that figured out how to get it to register. it's kinda dumb, but gets groovy after a while...the interface in terms of help is lame, but if ya hold your mouse oveer the icons they tell ya what's what. at first i was pissed, now i like it. peeps....right click your mouse to rotate pieces of the puzzle. I have the same problem as #13. It won't install at all. Any suggestions? This is a lot of fun and while it looks simple, it's really complex. Played this game a while back at a friends house and we were glued to it for hours. Now here it is again, but this time for free! Very cool and thank you for bringing great software to us! 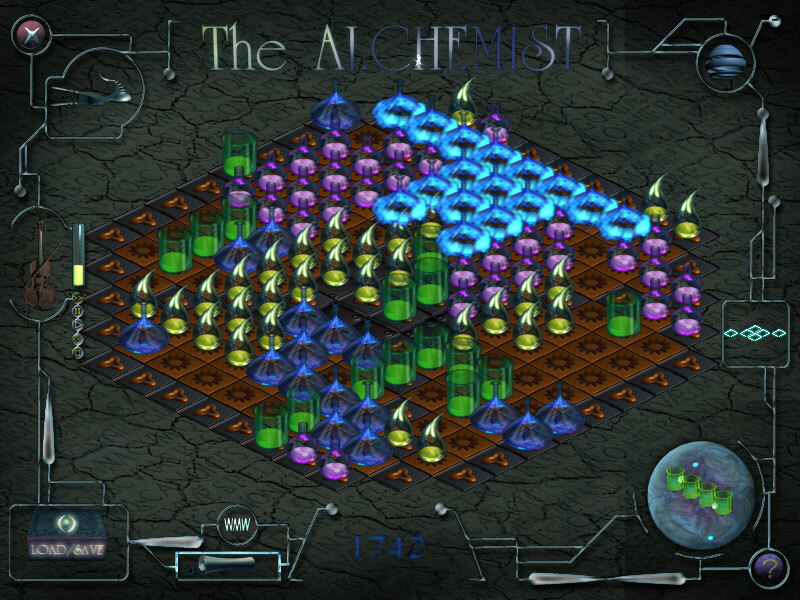 "Alchemist" was a puzzle to install, a challenge to register and then another brainstorm just figure out how to play. By the time I got it up and running, I was rather surprised at the games lack of variety and features. I'm not a fan of jig-saw puzzles. Because of the diagonal perspective, it's impossible to see empty spaces on a board that's filling up. You have to aimless left-click and right-click until it fits. The game no sound effects, only music that is best left undescribed. No Full Screen Mode, only Window Mode. The Installation Instructions are incorrect. Be sure to Activate the game after it has been installed, not before. 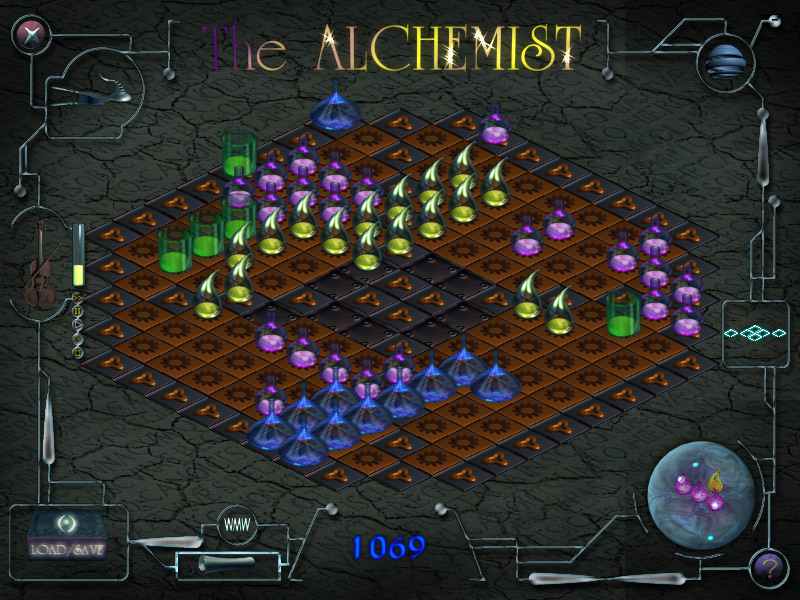 "Alchemist" was a puzzle to install, a challenge to register and then another brainstorm just figure out how to play. By the time I got it up and running, I was rather surprised at the games lack of variety and features. I'm not a fan of jig-saw puzzles. Because of the diagonal perspective, it's impossible to see empty spaces on a board that's filling up. You have to aimless left-click and right-click until it fits. The game no sound effects, only music that is best left undescribed. No Full Screen Mode, only Window Mode. The Installation Instructions are incorrect. Be sure to Activate the game after it has been installed, not before. Have any of you retards who are whining about no instructions actually try and look at the official website for help? Everything is clearly laid out there. This is the first time I could not get a game to run. I'm so disappointed. It installs, activates, but when I try to run it, I just get the opening jagged screen and it stops. My system exceeds all the requirements. I really think I would have liked this one. An intereesting relaxing game, the lack of countdown timer certainly reduces the stress quotiant. I notice there are no submitted hi-scores to the web based leader board, I suspect it is the demand for the email address in the submission process that makes submitters reticent. It did me! Activation on this one must be done after installation simply because the install script overwites any pre-existing key with "demo" if you cannot enter the valid key manually. Subsiquent Activation using Activate.exe will over-write the demo "key" with the full licensed key :-) Works fine on a PII 266 with only a 2M DX6 compatible vid chipset too, kinda makes a mockery of the bland bejeweled clone "Diamond Puzzle" offered the other day that ran at snails pace with far less going on on-screen and musically. Thumbs up for this one! An intereesting relaxing game, the lack of countdown timer certainly reduces the stress quotiant. I notice there are no submitted hi-scores to the web based leader board, I suspect it is the demand for the email address in the submission process that makes submitters reticent. It did me! Activation on this one must be done after installation simply because the install script overwites any pre-existing key with "demo" if you cannot enter the valid key manually. Subsiquent Activation using Activate.exe will over-write the demo "key" with the full licensed key :-) Works fine on a PII 266 with only a 2M DX6 compatible vid chipset too, kinda makes a mockery of the bland bejeweled clone "Diamond Puzzle" offered the other day that ran at snails pace with far less going on on-screen and musically. Thumbs up for this one! I could not get it registered either, so I reinstalled AND ran the setup FIRST ( company name - none, bottom line - gamegiveawayoftheday), THEN I clicked on activate. When I open the program now, there is no "registration" showing. Don't know which was the "magic bullet", but it is registered now. Wait, I posted this for the game giveaway, when it was really meant for the Nature Illusion Studio program. uhh, did anyone read the "Welcome" page (first page of the setup) ? "Welcome to the %s Setup program. This will install %s on your computer." This game is crappy and doesn't work! I installed and activated it successfully. But when I played it no music was there and the cd controls didn't work also certain buttons couldn't be clicked and the game was totally boring!